Antonio Conte - Enough is enough now. 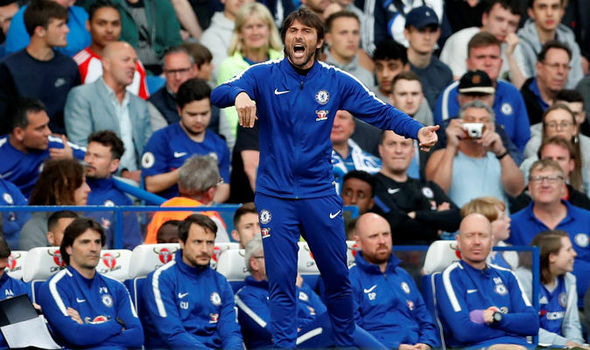 I'm sorry to say this and believe it or not, a year after watching one of the best seasons I had witnessed with 30 wins from 30 games, enough is enough now - Antonio Conte cannot remain as Chelsea Head-Coach beyond the summer. Let's take you back to yesterday at some point during the day. Knowing that we have well and truly fucked things up in the Premier League and found ourselves under-performing, dropping out of the top four and finding ourselves some way off the pace setters Manchester City, Antonio Conte still had a chance to rescue what has been a disaster with three vital points against Huddersfield to take us level on points with Liverpool and put pressure on Tottenham heading into the last game of the season. What does he do? Rather than play the team that has performed really well in the last four games to put us back into contention, the formation he spoke about last weekend of giving us "a better balance" to give us defensive stability coupled with giving Eden Hazard an opportunity to play in his best position in behind the main striker, he decides to revert back to a formation that teams have worked out how to deal with this year AND, make six changes to the team giving opportunities to players that just aren't doing it in recent weeks - I am talking of Morata, Pedro, Zappacosta and Willian. I was shocked when I saw the line-up pre-match but in a weird way I then realised that it was to be expected really. Antonio Conte and the Chelsea players have well and truly made a right mess of this season for one reason or another and this was the perfect demonstration. The only positive I can say about Antonio Conte from last night is that at least he made changes within ten minutes of going a goal down and not in the last ten minutes - it's only taken him 37 games to do so this year. When he leaves Chelsea this summer and there has been time to let things die down a bit, I hope that he comes out and admits to making mistakes this season. We have no plan B, he no longer influences games from the touchline as he did last year and that's the biggest problem. The thing is, I cannot see that happening and you would be better off making Russia World Cup 2018 predictions instead rather than wait for exactly that from Antonio Conte. OK, our attack has been woeful and we have not been anywhere near as clinical enough in front of goal which is what all of us will admit, but in-game you have opportunities to switch things about, to change formation and to put players in areas where they can hurt the opposition or at least create different chances to score. He has not done that at all and I will never forgive him for the way he set the team up against Manchester City away in a performance that he was happy with by the way! Enough is enough. For whatever reason, you have become a shadow of the man we all fell in love with last season and the lack of support in the stands is a clear indication that we aren't having you for longer than these two remaining games. I cannot thank you enough for last season. What a difference 12-months makes!